This is a post from my blog(move your feet) last October. It was my first summer moto riding our spectacular Green Mountains. "I'll begin with a glowing sigh as I reflect back upon this fanciful summer. Total satisfaction overcomes me when I think of the wind in my face on my adventures along the roads of these Green Mountains in the company of good guys on shinny motorcycles. I finally have a few pictures of the bikes, the roads and the expanse of space when we're out there; even one of my usual riding partner. Last weekend, we managed to ditch chores and abandon the firewood drill we are all obliged to perform every fall; instead we cruised one more, high mileage, ride through the North East Kingdom. Careful to stay out of the shady corners, veiled in perilous black ice on this mid-October weekend. In these pictures, the leaves are all down, so the views even more vast. A different experience from summer when all was green and the lanes enclosed in their emerald shag. In last Sunday's ride it felt other worldly, immense and powerful; a different planet in time and place. We went north and west, north and east and finally just plain north. We hit the Canadian border twice at remote, rural crossings with one patrolman (heavily armed), and the yellow road paint encircling the border post tarmac. We often had the road and even the village centers to ourselves. Bakersfield, Enosburg, Richford, Berkshire, Jay, Montgomory, Troy, Lowell, North Hyde Park, and home. 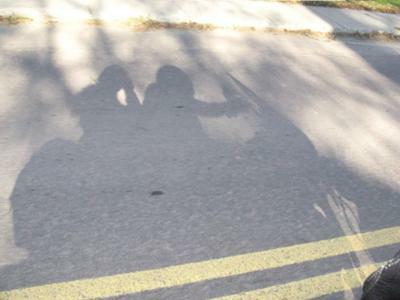 A scant few of any other bikers, die-hards for the last day of sunshine and dry pavement, rolling by with the trademark HD wave: a hip tilt of the left hand, palm down, low and cool, below a "cager's" sight line...It felt as if the blacktop was all ours and ours alone. Like a child on Christmas morning, I filled myself up with all of it. The rhythm of loud pipes, the scent of leathers, the warmth of my riding partner's heated jacket, the crisp of wind on my face, the brilliant sun on my back, enchanted by the view over his shoulder. I archived every detail in my mind and body. It will have to sustain me for the next 6 months and nourish my dream for more. The bikes are put away for winter and a future season in the next year. The summer of '08 was especially sweet, sensational in each outing with "the boys", as it was my first season and I had the pleasure to ride on Harley's, a Valkyrie, and a Kawasaki; all with good men who graciously shared their passion for riding and more than a few great stories. I wish I had taken more pictures to share, but its distracting for me and a little more effort for the driver when I'm twisting around on the back while he's threading the best piece of the road for a smooth ride. Next year, I'm getting my endorsement to drive motorcycles in Vermont with some friends and someday my own bike; but I will always pine for the second seat, riding two-up with a savvy guy, savoring every mile, feasting on the bounty of the journey. If you haven't ever gone out; try it just once, with a seasoned rider on a cherry bike, over our rolling hills, on a glorious day... just once, so you can say you did it."